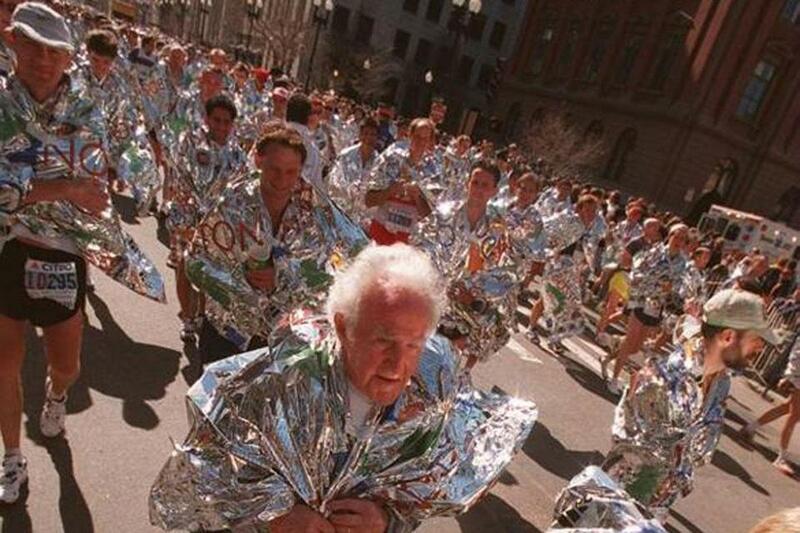 Marathons can have a curious effect on people, prompting some to shudder at the thought of ever trying one, while others are inspired to take up running on the spot. But some newbies apparently forget to consider an important part of the sport — the recovery phase afterward. Exercise specialists say that’s a mistake. Whether running, cycling, swimming, weight-lifting, or diving into some other equally demanding sport, actions taken in the minutes and hours afterward can directly affect how well the body recovers. Exercise, while beneficial to heart, body, and mind, tears down the cell membranes in muscles. Recovery helps the cells fix the damage and rebuild the muscles even stronger. A common misconception is that an excess level of lactic acid buildup in the muscles causes fatigue and soreness the day after a workout. Many athletes swear by icing — even soaking in an ice bath — after a hard workout to help reduce pain and inflammation. But studies have shown mixed findings on whether the practice is effective. A recent study by Dain LaRoche, an associate professor of exercise science at the University of New Hampshire, found no significant difference in strength, swelling, or soreness between a group of 10 men who soaked up to their waists for 20 minutes in a 41-degree ice bath after running 40 minutes downhill, compared with 10 who skipped the ice bath. Blood tests did find lower inflammation levels among the ice soakers six hours after the workout, but the differences were not statistically significant. The study, as are most that focus on exercise, was small and did not look at other relevant factors, such as diet, rest, and lifestyle, making it hard to extrapolate to a larger population. LaRoche noted that some inflammation after exercise is beneficial because it helps trigger white blood cells to come in and clean up the damage to muscles. But too much can damage healthy tissue. She advises her athletes after a hard workout or game to soak in ice water for five minutes, followed by five minutes in warm water and then five more minutes back in the ice. For weekend warriors, West says ice packs on an especially sore or swollen area should be sufficient. And most specialists agree that 15 to 20 minutes should suffice. The need for fluids after a hard workout is well known, but what’s the best approach? Dr. Vonda Wright, a marathoner and orthopedic surgeon at the University of Pittsburgh Medical Center’s Center for Sports Medicine, says marathoners are so depleted after a race, she advises they reach for lukewarm fluids instead of icy ones for faster absorption. “What your body does immediately is to try to make everything in it 98.6 degrees,” she said. For rehydrating after workouts lasting under an hour, water is the preference of most specialists. But after a hard session — defined by most specialists as weight-resistance or endurance workouts of longer than one hour — athletes typically are also depleted of essential amino acids, the building blocks of protein that cannot be made by the body. Amino acids help the body repair itself. Gregory Cloutier, project manager for the Human Performance and Exercise Science lab at Northeastern University, suggests athletes have two cups of low-fat or fat-free milk post exercise because milk is rich in essential amino acids and sugar. “Sugar helps the body absorb that protein for recovery and repair,” he said. For athletes who can’t stomach milk, Cloutier recommends whipping up a smoothie, for instance using soy milk (which does not contain the essential amino acids) combined with a whole grain such as brown rice. The combination would produce the essential amino acids, he said. Another option would be to drink water, but also eat a couple of energy bars that contain carbohydrates and seven to 10 grams each of protein, suggests Cloutier’s colleague, Rui Li, director of the lab. Just go easy on those sports drinks, which are high in calories, said West, the Pittsburgh Steelers’ orthopedic surgeon. “Sports drinks drive me crazy,” she said. The drinks are fine after long, hard workouts, she said, but not for the more casual athlete. Exercise specialists agree that warming up before a workout helps avoid injuries, but there are perhaps as many approaches as there are experts. Increasingly, however, the advice is to go easy on stretching before a workout, and better yet, save it for afterward, if at all. Lisa Colvin, an exercise physiologist and director of the Human Performance Lab at the University of Louisiana at Monroe, coaches athletes to instead jog for 10 minutes, followed by five minutes of walking and then “dynamic” drills – holding on to a tree while swinging their legs back and forth, skipping, walking on their toes, then heels – especially before competition. Brian Coyne, an exercise physiologist at Duke University, said most athletic trainers who teach classes, such as spinning, are usually good about ensuring that people get a proper warm up to avoid injuries. But they tend to skimp on the cool down, he said. Afterward is the “most critical time” from a cardiovascular standpoint, Coyne said. “It allows the blood to not pool in the exercised muscle, especially the legs,” he said. Pooling, he said, can cause dizziness, light headedness, nausea, and potentially abnormal heart rhythms. Compression socks and sleeves — which often come in jarringly bright colors — are increasingly popular among long-distance runners who say they help increase blood flow while running, cut down on soreness, and speed recovery. Studies on the garments, usually involving very small groups of athletes, are mixed. A team of French researchers concluded after studying 11 highly trained male trail runners who ran with and without the socks that the athletes’ perceived muscle soreness was likely to be lower after using them. But the March study in the International Journal of Sports Physiology and Performance found “possible, trivial, or unclear differences” in tests afterward that measured markers in the athletes’ blood for muscle damage and inflammation, known sources of soreness and fatigue. Beth Taylor, director of exercise physiology research at Hartford Hospital, said one big problem with compression studies is that athletes know when they are or are not wearing the garments, making it hard to tease out the psychological impacts — athletes perceive that they feel better — from the physiological, such as inflammation levels. Compression socks have been long used for older, sedentary people who are at increased risk for blood clots. The socks gently squeeze the legs to keep the blood from pooling around the ankles and that is believed to help prevent swelling and clots. Taylor’s lab is studying use of the compression socks among marathoners to determine whether they help reduce the risk of clots associated with athletes who fly before a race. The scientists aren’t sure what factors increase the risk, but believe it may involve blood pooling from sitting on the airplane, and dehydration from the combined air travel followed by running. The risk — indicated by a blood test that measures one of the breakdown products of a blood clot — is highest at the finish line, Taylor said, but 24 hours later, it goes away. “So it’s almost as if travel primes a marathoner for an increased blood clot risk,” she said. For runners, Dr. Paul D. Thompson, chief of cardiology at Hartford Hospital, said the general rule of thumb is one easy day of very light running for every mile raced, because athletes can injure themselves if they go right back to hard racing. Over-trained athletes often have trouble sleeping, Wright said, tossing and turning but not sleeping, and feeling tired the next day. So one other measure that you are ready to get back on the road? Whether you are sleeping well, she said.